The Great Silk Road is an ancient transcontinental trade highway, which for centuries connected East and West. It was also a channel along which the achievements of human intellect in scientific, technical, cultural, spiritual spheres were transferred and it played a big role in the development of the world civilization. The public interest to the Great Silk Road grew in early-1990s, when five Central Asian countries, whose territories were intersected by main caravan trails in the past, achieved their independence. There appeared the idea to revive the ancient highway as a main channel of the world cooperation in the areas of diplomacy, culture, science, trade and tourism. The concept was presented at the UN General Assembly in Bali, Indonesia, in 1993. The World Tourism Organization plays an important role in the accomplishing the concept of the Great Silk Road revival. WTO has developed a long-term tourist project called "The Great Silk Road". Over the last decade WTO made much for the development and promotion of tourism along the routes of the Great Silk Road. There were organized international forums, fairs, and conferences, in which a great number of representatives of tourist industry took part; there were published beautiful editions. Special attention was given to marketing strategies in this field. In order to integrate all countries and private persons interested in revival of the ancient highway, in 1994 WTO together with UNESCO convoked in Uzbekistan the first international meeting "The Great Silk Road". All nineteen countries participating in the conference adopted a truly historical "Samarkand Declaration on Silk Road Tourism". This project was supported by many countries and international organizations. Today tourist industry possesses in fact a huge potential and it contributes to the progress of many other fields and spheres. Like no other direction of business activity, tourism is extremely resistant to economic crises. At the heart of this phenomenon there lies a never-ending necessity of human beings to get to know the surrounding world. Shift in priorities in the consumption models can be easily observed: for many people traveling is no longer a luxury but a part of their lifestyle. In some countries, especially in Europe, there appeared such a notion as "right for travel", which is reflected in the Global ethic code of tourism adopted by the WTO. Tourism today accounts for eight per cent of world export of goods and services, which makes it the largest, market-oriented industry, which surpasses export of automobiles, chemicals, foodstuff, computer hardware and petrol. In 83 per cent of WTO member countries, tourism ranks among five leading export categories, whereas in 38 percent it is a main source of exchange earnings. According to WTO data, the number of international travels is rising on average by 4.3 per cent annually. Most of these travels are made in order to holiday and to get acquainted with unknown places and tourist attractions. The Great Silk Road as a tourist product has several peculiarities which make it different from usual routes. For instance, a classical tour is a journey to one certain country. The Great Silk Road tour is a transnational route which gives a traveler a chance to visit several countries and to get acquainted with their ancient culture and present-day life thus obtaining a lot more knowledge and impressions than during a classical tour. In the mid-1990s WTO set up a goal to develop an integrated transcontinental concept under the motto "Collaboration and joint efforts despite the frontiers". That was a new and rather difficult task as until that time the Great Silk Road was a non-operating potential tourist resource which had to be transformed into an important integrated travel product. To accomplish this goal various sectors of tourism industry had to be involved: hotel management, tour operators, travel and transport agencies and governmental bodies. And above all it was necessary to work out a clear marketing strategy in order to get over possible complexities that could appear in the course of the joint actions of the stakeholders. At the first in a series of Silk Road international forums of WTO held in Xi'an (China) in July 1996 a new international marketing strategy was adopted by all the participating countries. This forum was represented by 110 travel company leaders, tour operators, holders of big hotels, scientists and journalists from 25 countries as well as UNESCO and UNDP representatives. Here for the first time WTO got the opportunity to assist Silk Road countries in building close business relations with tour operators of the leading tourist markets. The main goal of the market strategy was to create a steady and constantly growing demand for the new travel product. The main source of data for developing the marketing strategy was "Research project to assist tourist exchange with developing countries and countries on territory of the Great Silk Road". The project was accomplished by Asia-Pacific tourist exchange centre (APTEC) established in 1995. Furthermore, there was set up the Committee for supporting tourism in the Silk Road countries. The tourism makers were especially interested in results of researches made in the course of implementation of the project in Xi'an and Xinjiang-Uygur autonomy region of China. It was dedicated to the analysis of possibilities to expand the Japanese tourist market. Further introduction of the Great Silk Road tourist product to the biggest and rapidly growing Japanese market became one of the main missions of the WTO forum in Xi'an in 1996. The Forum defined the main factors for developing Japanese tourism on the ancient transcontinental road. The agreements achieved at the forum in Xi'an were further developed at the Second International Forum organized by WTO jointly with UNESCO and APTEC centre in the Japanese town of Nara in January 1997. This forum gathered official representatives from 19 countries. Their main mission was to realize the principles of integrated marketing strategy aimed at promoting tourism along the Great Silk Road. Another step in further promotion of a new transcontinental tourist product was the second international meeting of the Great Silk Road countries in April 1997 in Teheran, which was also supported by UNESCO. The representatives of the national tourism authorities, international organizations and tour operators from 27 countries took part in that meeting. The main idea of the meeting was to expand by means of tourism the international cooperation and cultural exchange along the whole length of the Great Silk Road. The UN General Assembly session which was held in October 1997 in Istanbul (Turkey) enabled the Silk Road countries once again to get together and analyze the progress of the project developed by WTO. The session resulted in a number of new resolutions passed by its participants. There was adopted the Action plan on creating and developing the Silk Road handicrafts training centres using broad experience of UNDP similar project which had been implemented in Uzbekistan. Furthermore, the session participants supported the proposal made by a group of journalists from New Zealand on making 26 series of television travelogues devoted to the travels along the renascent caravan roads. The progress of marketing strategy was also stimulated by WTO thematic stand on the Great Silk Road. It was exhibited at all main international fairs such as ITB in Berlin, WTM in London and FITUR in Madrid. It enabled the participants of these international tourist events, both the suppliers and the customers of tourist product, to study in detail the travel market supply-and-demand. 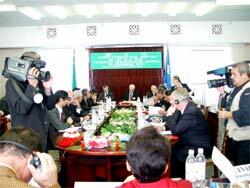 Next steps under marketing strategy were undertaken in February 1998 when the subsequent tourist forum on the Silk Road took place in Kyoto (Japan). Due to the fact that Japan remained one of the most important travel markets, the main goal of the forum was to further study its tourist potential and peculiarities. The methods of improving the quality of tourist product and raising its competitive capacity in the main international markets were widely discussed at the seminar of tour operators from the Silk Road countries. The seminar was held in Almaty (Kazakhstan) on September 28 - October 2. The participants made a critical evaluation of the work done, revealed strengths and weaknesses of the tourist product and developed effective measures on its improvement. Following the forum in Xi'an, where marketing strategy had been elaborated and appropriate action plan had been developed, WTO was constantly engaged in their implementation and searched methods of improving new tourist products with regard to the changes existent in tourist markets of different countries. The third international forum of WTO held in November 1998 in Tbilisi (Georgia) was devoted to these issues. The special session within the framework of the forum was devoted to Georgia, whose representatives provided detailed information on the country in general and the arrangements aimed at the country's travel industry development. The general situation of tourism in the CIS countries was also reviewed. Once again much attention was paid to certain complications connected with obtaining visas, especially in countries of Central Asia, and lack of clear and trustworthy information in respect of visa issue conditions and procedures. Besides, the participants of the forum appealed to airlines of the Silk Road countries and the CIS in particular to intensify cooperation among them in order to elaborate realistic and competitive pricing for air carriage. Market relations can become the basis for modern tourist industry on the Great Silk Road. Tourism, more than any other field of economy, is orientated on consumers, their demands and interests. Therefore the participants of the forum in Georgia were presented with a development program consistent with these conditions. Close cooperation of WTO and "Great Silk Road" project member countries made for the secretariat of the World tourist Organization to undertake effective measures in order to produce an image of the Silk Road as a viable tourist product and to create a full database on its itineraries in the international markets. 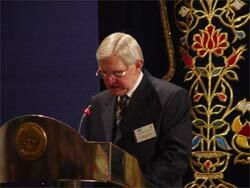 In October 2002 the ancient land of Uzbekistan hosted the fourth WTO forum on the Silk Road issues. This forum was held in Bukhara which is universally recognized as one of the pearls in the necklace of the Great Silk Road and is included in the UNESCO World Heritage List along with Samarkand, Khiva, and Shahrisabz. WTO regards Uzbekistan as a key country on the ancient transcontinental highway connecting Europe and Asia. Within the framework of the forum agenda WTO presented original studies titled "Simplification of visa formalities on the Silk Road". The reason for the forum to raise this issue, which had been discussed at a number of previous meetings, was the fact that visa, customs and frontier barriers had a dramatic effect on the realization of the transcontinental tourist product. Certain attention was paid to the issues of further promotion of the tourist product in the world markets by means of up-to-date information technologies. WTO approved and recommended to publish the new guide book The Silk Roads prepared by Trailblazer Publications international company. The participants of the fourth international meeting of WTO approved the "Bukhara declaration on tourism along the Silk Road", in which the WTO resolution on opening in Samarkand of the Silk Road International Office was stated. Samarkand Office performs interrelation and regional cooperation of the Silk Road countries and promotes their participation in travel fairs and in other events aimed at the development of tourist product "Silk Road". The Office has become a new coordinating centre on realization of the unique international project. Today WTO is the only worldwide intergovernmental organization devoted to travel and tourism. As a highly developed branch of industry, tourism helps to bring nations and countries together; it promotes the emergence of the global culture, which absorbs the spiritual treasures of the ancient and modern civilizations. Of great importance for this process is the revival of the Great Silk Road - the project which is carried out under the aegis of the World Tourist Organization.